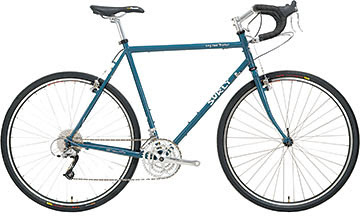 Brent at CC/Peninsula gave me a heads-up that the Surly's are a hot ticket down there right now, and that they just sold two Surly Long Haul Truckers in one day. BOTH were 62 cm, which is the biggest size they make, a bike we normally sell two of a year, much less two in one day. Give it up for the tall men and their love for Surly! That said, it's not just a bike for the height-advantaged. The Long Haul Trucker (pictured above) is a great touring road bike for anyone to consider who likes really long bike rides. It's designed by Surly for all day, everyday comfort, whether that's going to work every day or (as Surly says) "to La Paz, Bolivia, via Homer, Alaska." We have a 56cm Long Haul Trucker in stock, as well as a 54cm Cross Check (cyclo cross season is almost here!) and an 18-inch Big Dummy frame. However, most frames and stock completes can be ordered and in by the end of the week.